Spectacular Japanese style home on one acre with a pool. The other acre has been hand cleared by our gardeners to preserve the natural flow of the lava. Native plants and fruits have been planted along the lava rock. Hear the waves break on the lava cliffs just a couple blocks from the home. This one-of-a-kind home features two master suites. Each suite has approximately 600 square ft. and includes sleeping and sitting areas with a Smart TV and VCR/DVD. The main living area features the fully equipped kitchen, formal dining, informal dining, formal living room and large main entry. All rooms are tastefully decorated with Japanese art. Inside the home is a private garden with tropical plants and flowers which accent the small waterfall, stream and fish pond. We feature a private pool with a large deck plus covered lanai for BBQ and relaxing. The home is 3000 square ft and is on one fully landscaped acre. We are maintaining the one acre lot across the street from our home. Our landscapers have hand cleared the lot to preserve the natural flow of the lava. Our guests are welcome explore the one acre lot and observe the native plants we've planted. My wife and I purchased our home in Hawaii in 2000. We are pleased to offer this unique Japanese living experience to you when we are away. We looked for several years for a home on the Big Island that we would enjoy living in. The unique Japanese design, quality of construction,open living areas, ocean view, private and peaceful setting made this home an easy choice for us. This is where my wife and I go to get away from it all. It is easy to forget the normal pressures of everyday life in this private and peaceful setting-our Sanctuary in Paradise! We own the lot across the street from our house. The lot was hand cleared to preserve the natural flow of the lava. Our landscapers have planted many native plants. Guests are welcome to take a walk on the 1 acre lot. Our home is a few blocks away from the ocean. Sheets, Blankets, Comforters are provided. The washing machine is located in the house. The dryer is located in the house. Plenty of parking. Please don't park under the coconut trees. We have two bikes, a few fishing poles, and a variety of snorkeling gear. The living space has a couch and relaxing chairs. Their are also other rooms in the home for lounging. There are often spices and condiments. Electric kettle, blender, hand mixer, waffle maker, crock pot, baking pans and pyrex, measuring cups, spoons, and utensils needed for baking and cooking. The yard is landscaped once a month and planted with native plants and fruit trees. We also own the lot across the street which was hand cleared and also planted with native plants and fruit. A few snorkeling masks and fins are available for use. Fish pond, fully landscaped acre with coconut trees,seasonal star fruit, mangos, breadfruit, cashews, pineapples, as well as citrus trees. Two bicycles and helmets for your use; Some fishing and snorkeling gear are in the breezeway. 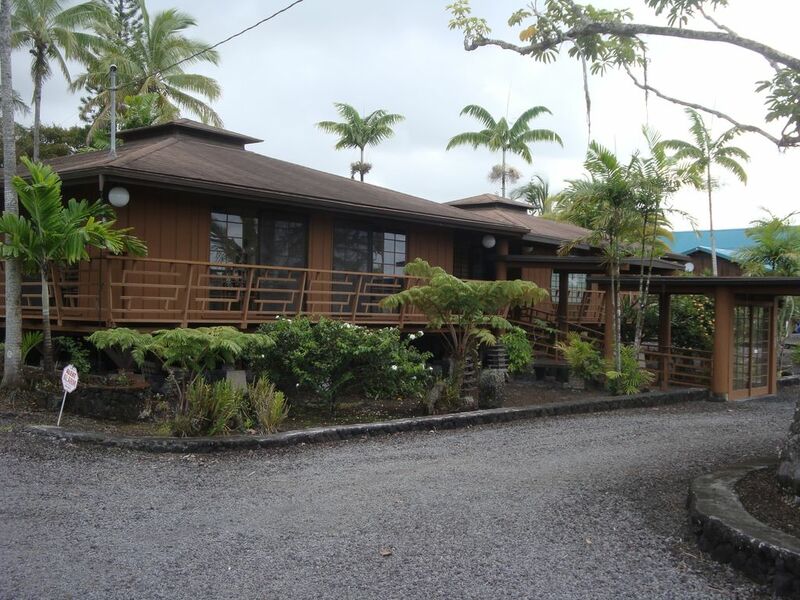 Our home is close to the Pacific Ocean, water falls, lava flows, hot water pool heated by volcano, and great dining. Some of the above checked activities are available on the Hilo side of the Big Island.